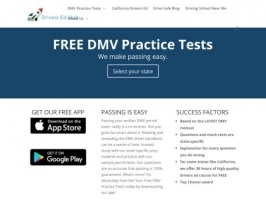 Study for your DMV driver permit test with our Free DMV practice test. Our most popular tests are California DMV Test and New York DMV Test. Make Passing Easy with our drivers ed tests. We are also DMV certified Online California Drivers Ed provider.